Once you identify the issue, how do you get back on track? BONUS: keep it from happening in the first place! You're not reaching your goals/metrics. Whether the goals are the number of phone calls, new patients, or a collection percentage, if you're not reaching your goals, this could be a sign. It could be a downward trend over time, or maybe all the of the sudden one month's performance leaves you scratching your head. Of course, it could be something external that causes you to not reach goals (or that your goals aren't on point), but assuming you've been hitting them, and then aren't, you could be off track. There's low energy and/or low morale among your staff. You can tell when things at the office aren't running as usual. Maybe everyone is just getting back from the holidays and moving a little slow. But maybe your staff has lost a little of their zest because they've lost sight of the overall vision for the practice. If the low energy persists over time, you'll have a bigger problem on your hands as it will impact patient experience. Boost that energy and get your staff back on track sooner rather than later. Patient satisfaction is down. You're having trouble getting people into the office or accepting treatment plans. You're seeing an uptick in negative reviews online or maybe just a diminished number of positive reviews. There are fewer referrals coming into the office from patients who send friends and family your way. By looking at a number of metrics, you can see that overall, patients aren't as happy with your office as they once were. This is probably the final symptom—the one you'd see last. By addressing your problem sooner, you won't have to deal with the fallout of having unsatisfied patients! Once you've figured out that your practice is straying from the mission and vision you've put into place, you have to take corrective action. Let's look at some steps you can take to best address the issues and get your team back on track. This technique may be useful in identifying why your practice is off track. Without knowing the reason, you can't fix it! All you can do is keep patching the problem—over and over. This doesn't help you move your practice forward or grow. By digging deep and doing the work, you can truly solve the issue... and then move on to another! Often, you know the source of your problem. But other times, you have no clue! The 5 whys can really help you zero in and address the heart of any issue. This is a different why from those addressed above. Your why is the answer to why everyone in your practice is even there every day! Why are you there? Why have you built this practice? The why can also show each of your staff members why you need them, and why they are a part of your team. Talk to them about how important they are to you, to the practice, and to the overall vision of what you're all there trying to achieve. The why matters! You have leaders in your office, whether they hold supervisory positions or not. You know who we're talking about—the folks in your office who influence the rest of the staff. This can always be used to your benefit, but you have to get them onboard. Individual meetings with them to help them understand their role and how important they are to you and the office can go a long way. Encourage them to keep the momentum going and keep the mission and vision in mind. It can be too easy to point the finger away from you, your staff, and your office when things aren't going smoothly. It's natural to blame outside forces for coming up short in your goals and benchmarks. And there can be truth to the impacts of weather, seasons, the economy, and other things outside of your control. But you have to look at your house first. Are you all holding up your end of the deal? Is everything going the way it should to reach your goals? 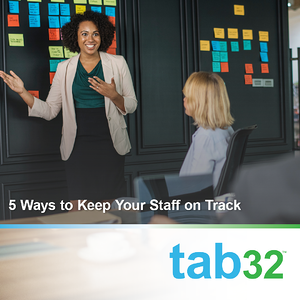 Are you or your staff cutting corners? Where can you all make improvements to give your patients a better overall experience? Start first on the inside, then work on anything that may be at play outside the office. Be sure to listen. Making unilateral decisions on the operations of your office without their imput can be disastrous! Not only will you not have their perspective, you definitely won't have their buy-in to support any changes. And you have to have that buy-in. It's not enough to say you're listening—you have to prove it by taking that feedback and using it in your decision-making process. From staff meetings to meeting with supervisors, to those meetings we mentioned above with your influencers, you have lots of opportunities to listen. Don't miss those. Keeping your staff happy, listening to them, and implementing change based on that feedback will go a long way in the success of your practice. Our last piece of advice on realigning your practice to your vision is the simplest, but maybe the hardest: keep it from happening in the first place. Talk about the vision often (huddles, team meetings), remind your team of the importance, and be sure to recognize staff when they do things that promote that vision. By staying the course in the first place, you won't have to do any correcting. At tab32, we're committed to helping you build the practice you envision. Our comprehensive practice management platform makes it easy to keep track of your goals, give staff metrics to monitor, and most importantly, give your patients a flawless experience in your office. Learn more today.